Local railfan Taylor Woolston provided this narrative of a recent railfan adventure he had in the greater Winnipeg area... via bicycle! Railfanning can sometimes be boring, with a lack of good or interesting power, and sometimes a lack of trains in general. Hoping that my luck might change for the better, I went railfanning on Monday, May 30th 2016. OH BOY. In my opinion, this was one of my best railfanning days ever from an overall point of view (Not just because of 1 train). Let's start from the beginning. Every second school day, I switch between half days and full days. Today was a half day and I hadn't railfanned for awhile, so I decided to bring my railfanning equipment to school and go out right after school at lunch. I decided to head northeast, into the St Boniface area of Winnipeg. I checked out the Greater Winnipeg Water District (GWWD) rail yard along Dawson Road, and noticed that the gate for the road into the yard by Messier Street was open. With that, I thought there might be a possibility of seeing the GWWD operating. They have 2 MLW RS23's, and seeing them operate is always a treat, but they aren't easy to catch. 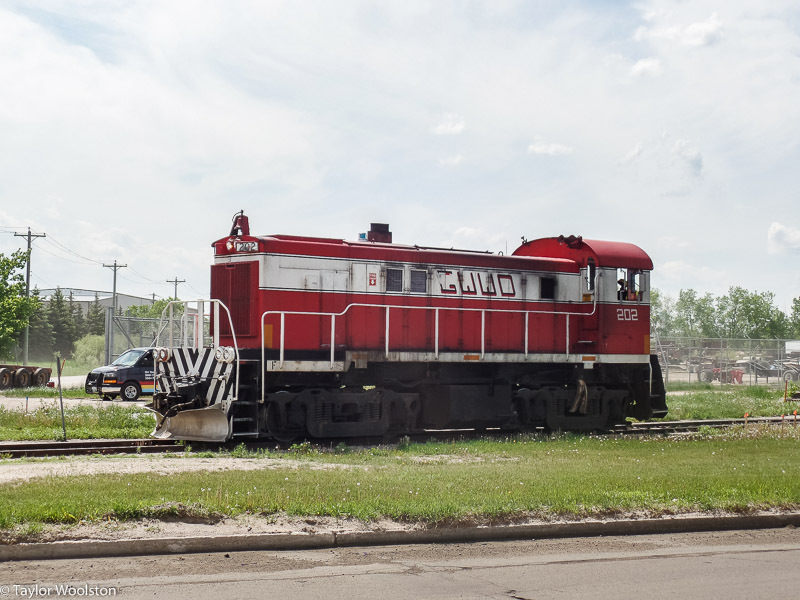 After checking out the yard, I continued on and ended up going to an area where the GWWD crosses CN's "X Tracks", which takes trains in and out of CN's big and busy Symington Yard with 3 tracks to work with. The GWWD crossing creates a triple diamond across CN's tracks. 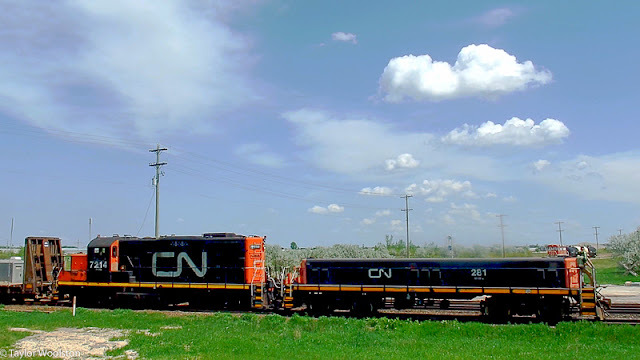 There is a hill that parallels CN's tracks, which is where I set up. After waiting for a while, CN 347 showed up and crawled out of the yard on track X3 and stopped short of the diamonds. 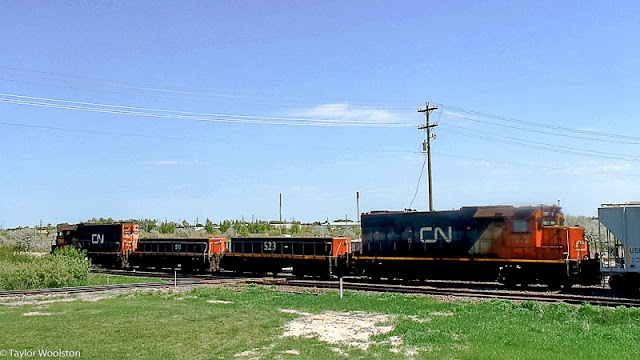 Their power was CN 8921 (SD70M-2) and 2408 (C40-8M). 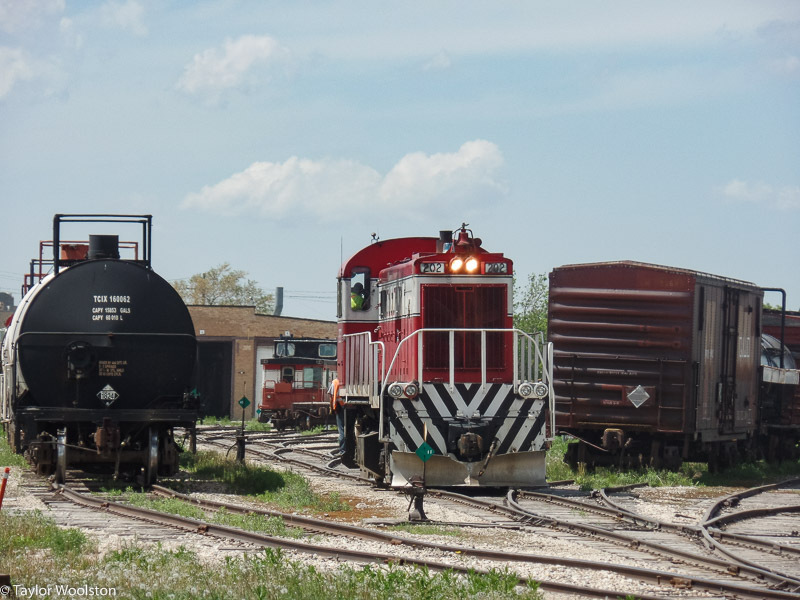 Shortly after, a GP38-Slug-Slug-GP38 set pulled across the diamond with a string of cars and stopped, then pushed hard back into Symington and disappeared. After waiting for a while, a CN van (no, not like a caboose) came up to the head end and dropped off the conductor. Shortly after, CN 347 took off heading west. After they passed, I waited for a while with nothing going on. 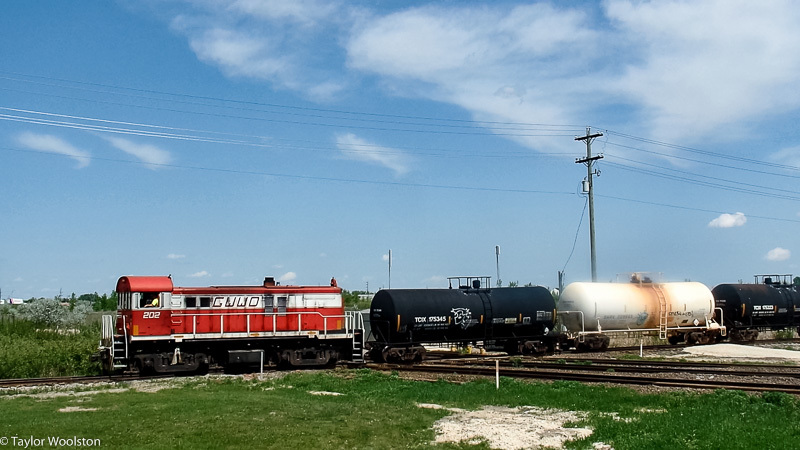 Suddenly, I got word that the Central Manitoba Railway (CEMR) wanted to enter Symington. 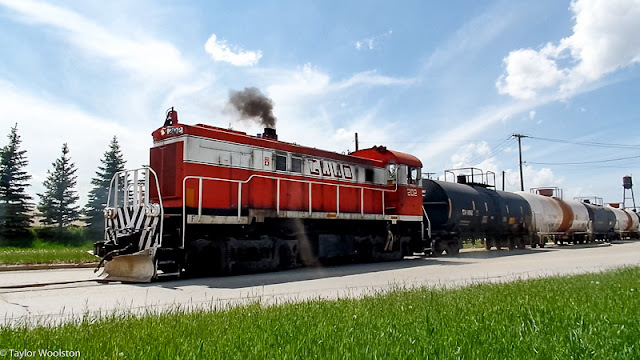 I decided, with almost no chance of seeing the GWWD, to ride up to Dugald Road, where an overpass crosses over the CN X tracks, to make absolutely sure that no other trains block my view of CEMR, and to get a different perspective. I packed up, rode up to the nearby street, Lagimodiere Blvd, and went towards the overpass. However as I crossed the GWWD, I saw something that made me slam on the brakes..... TRAIN! A GWWD train returning from the Deacon Water Treatment Plant! Unsurprisingly, they had to stop before crossing over CN. I decided to go back onto the hill and set up there. As I was doing so, I heard something - the unmistakable sound of a GP9RM working hard. 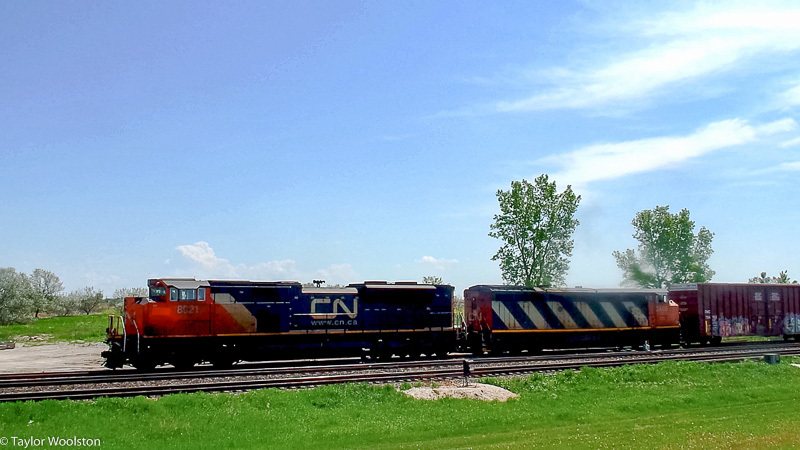 At first I thought it was the CEMR train, but it turns out it was a CN local bringing some cars into Symington. CN 281 (Yard Slug) and 7214 (GP9RM) led the freight into the yard. Just a few minutes after the local cleared, the GWWD got their signal crawled across the diamond towards their yard with 3 tanks in tow. The unit they were using today was #202. The last time I saw this operation, I learned that they drop off the tanks from Deacon onto their interchange track with CN, and pick up ones that CN has left for them. Knowing this, and the fact that they don't exactly go very fast through here, I decided to wait a few minutes for CEMR to hopefully arrive. Sure enough, a few minutes later the CEMR train rolled into Symington with CEMR 4002 and 4000 (a pair of GP9RM's) in charge. After the CEMR roared past, I started what should have been an easy chase of the GWWD, but my rear tire picked the perfect time to burst on me, meaning I was now stuck on foot, rolling my bike around. I zigzagged through a couple of side streets before getting to where the GWWD crosses Dugald Road, with a couple minutes to spare. 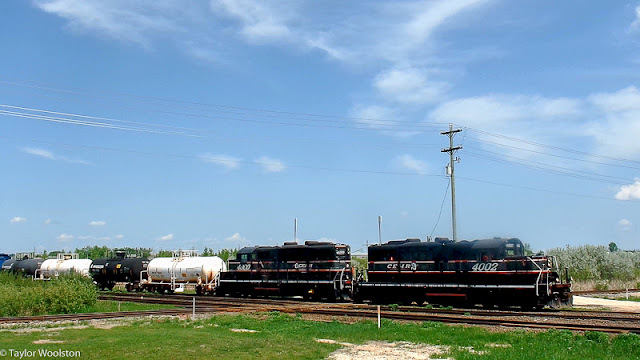 After having dropped off the tanks from Deacon and picking up the tanks from CN, they now had 5 tanks with them, and brought them towards the yard. 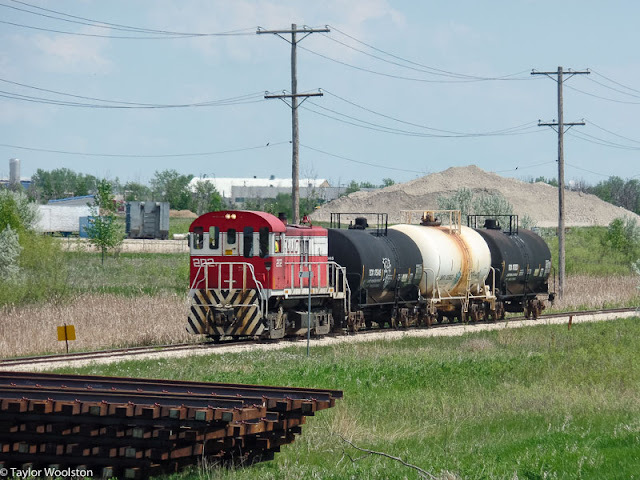 In order to get the tanks into the yard correctly, they have to stop short of the yard, and use a siding to run the locomotive to the other side of the cars. Without even fully retracting the tripod, I ran with the bike as quickly as possible to where the GWWD crosses Dawson Road and Messier Street. The Dawson Road crossing is incredibly shallow, with the rails being in the road for almost 54 metres (176.5'). Compare that to the Messier Street crossing, where the rails are in the road for only 15 metres (50'). By the time I got to the crossings, covered in sweat as it was a hot day, they had coupled the locomotive to the other side, and the conductor was walking up towards the road to manually activate the crossing, protect it and ride the tanks into the yard. As the conductor rode across, he asked me how I was doing, and I gave him a big thumbs up! Once they dropped the tanks in the yard, the conductor deactivated the crossing, and they ran the unit back to the engine house, ending another hard day of work. Once I was done worrying about the GWWD, I now had to worry about getting home. I was around 5 km (3.1 miles) away from home, and was on foot with a bike in bad order, and that's just the direct distance. I have a cellphone, so I could have called my dad to get the car bike rack out and give me a lift, but I decided to brave it out and go home on foot. 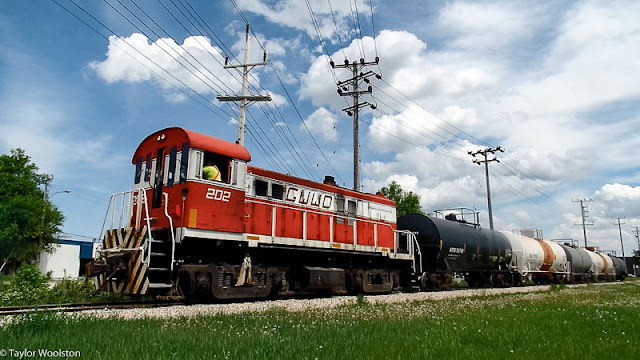 As I crossed the nearby CP Emerson Subdivision, I saw a northbound freight coming, and it was not far away at all! I had just a minute or two for setting up a shot. It wasn't very good, but oh well. It was a fairly standard freight with nothing special on it.... until the end that is. 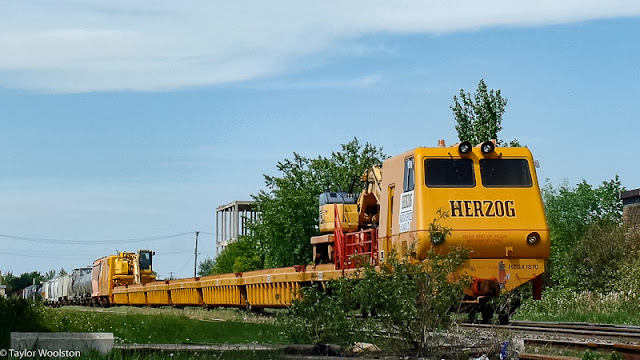 On the end, there was a HERZOG tie train attached. 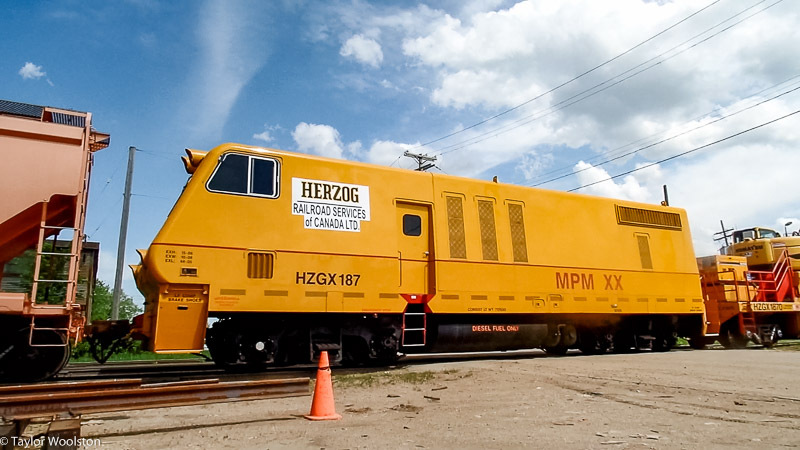 The head-end of it was HZGX 187. Once it very slowly crawled past, I made my way home after a great day of railfanning, even with the epic tire failure. I encourage you visit Taylor's YouTube channel and subscribe! Thanks for liking and sharing the story Steve! That's more trains than I see in a month. Great post, Taylor. Thanks for sharing this Steve.